All modern devices have some form of a “power save” mode. The power save mode will darken the screen, turn off non-essential features, in some cases it may even make your screen show in black and white. *For laptops – (Windows 10) In settings look in settings -> system settings -> Display to lower the brightness. In addition look in settings -> system settings -> power and sleep to set how quickly after inactivity the screen and/or the device itself will turn off (sleep). *For laptops – (MacBook) In system preference look for Energy Saver where you can set how quickly the computer and display go to sleep. 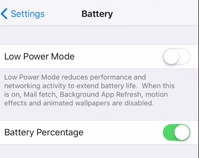 *For iOS – In settings look for Battery, then under battery turn on Low Power Mode. Keep in mind that low power mode will turn off mail fetch (which means you wont get email automatically), background app refresh, and animation. *For Android – Depending on the manufacture the setting name may be different. In settings look for any of the following Low Battery Mode, Ultra Power Saving Mode (Samsung), EXTREME Power Saving Mode (HTC), or STAMINA mode (Sony). Another thing you can do is turn off push notifications. That means that your apps wont automatically scan for new text messages, emails, or social media posts. Every time the apps go out to see if you have a new message you are using your battery. Depending on your device, check in the settings area to disable push notifications. How bright is your screen? The brighter your screen is, the more you are using the battery. On a pc, you can dim your screen in the settings (Windows) or system preferences section (Mac). On the iPhone swipe up from the bottom of the screen or on Android swipe down from the top of the screen to see the screen brightness setting. Lastly, you can turn off some or all of the features of your device. If you have GPS, NFC, Bluetooth, or Wi-Fi on you are using up more of your battery. So turning off as many of those features as possible will save your battery. If you really want to save your battery, put your device in airplane mode (which means it will not send / receive messages or calls). All you would need to do is take it off airplane mode as needed.